Portable Document Format (PDF) is a common file format for documents. It converts our files into a clean look, design which can be opened with a browser, Google Drive or Acrobat Reader like software. PDF outputs are generally difficult to manipulate and edit. So we can quickly send it to anyone without afraid of losing its originality. PDF doesn’t mean that it can contain only texts, but it can contain many other things including audio, video, links, graphics, form fields and buttons. The size of a PDF file depends on the page numbers and media it carries. While uploading or sharing a document online, some websites will ask you to reduce the file size according to their policy and guidelines. There are several websites which allow users to upload a maximum 1 MB – 5 MB size file. It means you can’t upload a large file and you need to compress it before sending. 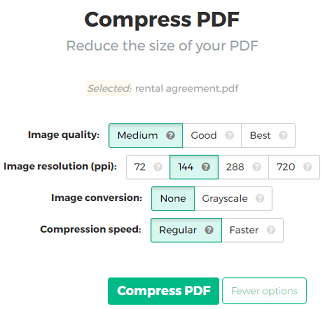 Sejda is a prominent tool to compress and reduce the size of a PDF file. It offers free service for documents up to 200 pages or 100 MB and 3 tasks per hour. In four ways, you can upload files to the server for compression- Direct upload, Google Drive, Dropbox and web address URL. Visit the website first to begin the process. Click Upload PDF files button to choose your input from the system. Click on the drop-down arrow to explore other input options. Once your file is successfully uploaded, you will get a screen like this. Choose More options to get additional settings for compressing the file. Set your image quality, PPI, image conversion and speed here. But remember that, the file size will vary based on the options you choose. 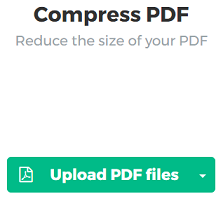 Hit Compress PDF button to process your task. It will take just a few moments to finish the job and finally, you will get this kind of screen. You can either download the output or go with other options. It includes saving to Dropbox/Google Drive, send by email, generate a shareable link, edit and convert it to other file formats etc.